Search has changed everything. Has your business harnessed its full potential? A business's search strategy can have a dramatic impact on how consumers interact with that business. But even more importantly, search engine activity provides amazingly useful data about customer behavior, needs, and motivations. 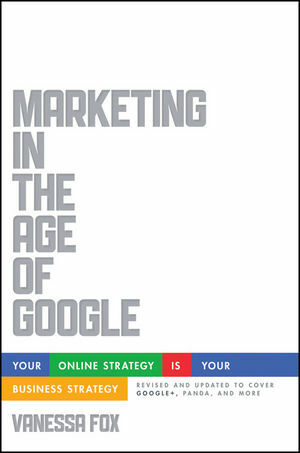 In this non-technical book for executives, business owners, and marketers, search engine strategy guru Vanessa Fox—who created Google's portal for site owners, Google Webmaster Central—explains what every marketer or business owner needs to understand about search rankings, search data, comprehensive search strategies, and integrating your strategy into the businesses processes. Explanation and recommendations related to Google's substantial new search algorithm, know as "Panda"
Traditional marketing isn't enough anymore. Businesses need to evolve as customer behavior evolves. Marketing in the Age of Google shows you how. VANESSA FOX is a leading speaker and consultant on search engine strategy. She was previously Google's search engine spokesperson responsible for explaining Google's search algorithm to millions of website owners. She has appeared in the Wall Street Journal, USA TODAY, The Times (of London), Forbes, and on CNN. She's a contributing editor for SearchEngineLand.com and founder and CEO of Nine By Blue, which provides reporting tools and training for search best practices.